Vandalism on the car and home of recent emigrees to Portland. I just looked at the paper, and what I saw brought me down.That's right I just looked at the paper, and it really brought me down.Somewhere in Portland, somebody's house and car got tagged by an angry clown. Now please, don't get me wrong here: I understand where the native Oregonian xenophobia comes from. My family first began visiting Oregon during the Tom McCall years, when that curmudgeonly governor famously put a sign on the border with California that proudly declaimed "Welcome to Oregon; enjoy your VISIT." Oregon is a state of great natural beauty peppered with funky cities that are full of cultural idiosyncrasies. All of that wonder and charm was, in my youth and young adulthood, enhanced by the fact that there just weren't that many people around to crowd my family out. There was always room at a state park for our trailer, always a parking space near wherever we needed to be, always plenty of this state to go around. Housing costs were low, rush hour was nonexistent, and Oregonians were warm, friendly, and polite. And then word got out, and the exodus began. Oregon of the 1970s saw it coming, and it wasn't just Governor McCall who tried to put a lid on it. There was a whole movement within the state dedicated to keeping the strangers out. It's possible that movement contributed to the state's economic woes: during his 1982 reelection campaign, Gov. Vic Atiyeh famously blew up the "enjoy your VISIT" sign, hoping to spur growth through a more welcoming attitude toward our neighbor to the south. And it worked: Portland, in particular, began to grow exponentially. It's become hard to find affordable housing in this city, and there are highways that are continuously congested for most of the day. The migration has brought with it a diversification of Portland's population: my suburban neighborhood has a high number of Indian households. Other parts of town draw Mexican, Chinese, Vietnamese, Ethiopian, and Somali immigrants. As much as the state and city have encouraged this influx, and as much as it has benefited our overall economy, there are Oregonians who, for one reason or another, wish they'd all go back where they came from. I don't know it for a fact, but I suspect many of these people are, if not Trump voters, at least sympathetic to Trumpism. They'd rather Oregonian stayed the way it was when they were growing up: roomier, quieter, whiter. As I said, these people have been around since before I arrived here. In fact, while the objects of their prejudice may look different from those being vilified by the Portland branch of their cult, they're everywhere in this country, in far higher numbers than many of us had realized: there were enough of them, concentrated in enough places, to elect Donald Trump President. And if polling is any indication, there are a substantial majority of them who are holding fast to their belief in him, no matter how drastically he continues to disqualify himself for the job they gave him--because, I expect, they know he will go on slamming doors in the faces of immigrants, right up to the day when he is escorted out of the White House by Capitol Police, only to be pardoned ten minutes later by new President Mike Pence. He was describing the apocalypse, which would feel like the end of the world, but was really just the growth pains of modern civilization. It was a time of great political turmoil in the Roman Empire, as each caesar proved more corrupt and ruthless than his predecessor. The empire endured for centuries after that time, until it was finally overrun by northern barbarians; but that's another story, far bigger than I have the time to write (or you the time to read, if I haven't already lost you). Across America, we see divisions growing. As Jesus observed, some of those divisions split families. Friendships have ended over the results of last November's election. It's an open question whether this nation can survive in anything approximating its pre-Trumpian state. Of course, the divisions in Congress really date back to the 1990s, if not earlier; but I can't escape the feeling that partisanism in Washington has reached a new high. But the splits are not simply along party lines. There is a rural-urban chasm that is growing deeper. If electoral votes were truly distributed by population, Hillary Clinton would be our President. In fact, though, the formula for arriving at those votes is subtly skewed toward rural states, diluting the power of Northeastern and West Coast metropolitan centers, which tend to be significantly more Democratic than Republican. That divide closely parallels the partisan divide, but belies the reality that the parties themselves are beginning to pull apart along populist/establishmentarian lines: Tea Party Republicans seek to abolish government-sponsored health care altogether, while moderate Republicans reject ACA "reforms" that would end the Medicaid expansion. Meanwhile, populist Democrats advocate for single payer health care, a substantially higher minimum wage, and free college tuition, while their moderate establishment counterparts worry about alienating independents. Which brings me, finally, to Independence Day--or, as I would rather call it, Interdependence Day. 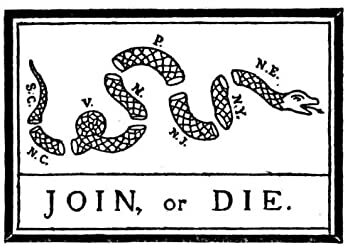 Of the many symbols used to promote the American Revolution, the divided snake may have been the most potent. The founders understood that any one colony, by itself, could not hope to resist the immense British Empire. United into a single force, the thinking went, Americans might have a chance. In the end, unity won out, but at a high cost: the Constitution was packed with compromises that, while keeping the Southern states part of the new nation, also sowed the seeds of division that led to the Civil War, and which still bedevil us today. And yet, without those troublesome southern colonies with their peculiar institution, the nation would never have come to be, or continued to exist. That's why "Independence Day" is a misnomer. The USA is not a confederation of fifty little republics paying lip service to a figurehead potentate. It's a paradox: a diverse people maintaining their uniqueness from each other while simultaneously uniting under a single centralized government. As much as I want to see Donald Trump perp-walked to a police cruiser, I do not want to arrive at that event through another revolution. I want it to happen because the diverse voices of the republic unite in condemnation of his corruption and disregard for the rule of law, forcing Congress to apply that very rule to him and remove him as the Constitution dictates. The more ridiculously he acts, the more likely that becomes, so I'm sanguine that this regime will come to an end before 2020. What worries me, though, is that his followers may not respect the rule of law, and may take the many guns they have used their expanded second amendment privileges to purchase to stage an insurrection. They won't succeed--no matter how many guns they may have, the National Guard has more, and better, weapons--but the carnage will be devastating; and again, as Jesus said, family members will turn on each other. It will be a terrible time for the nation, a time from which we will not heal for generations. And yet, yesterday's experience gives me hope. Portland's annual Waterfront Blues Festival brings in performers from across the nation and around the world, and they are as musically and ethnically diverse as you will see at any music festival. It's astounding to see how many genres have grown out of the simple sounds and rhythms of African-American slaves mitigating their suffering through song: gospel, R&B, bluegrass, Cajun, country western, jazz, rock and roll, funk, disco, hip hop, and so many more. Every performer I heard put a distinct spin on this music. Many played off each other, welcoming guests up on the stage with them, encouraging the audience to sing and dance along. At times on the big lawn, with its two alternating stages, one could hear the next band to perform warming up by playing along with the band currently in the spotlight. The crowd rolled with each change of music, shifting its attention from one stage to the other, a group of dedicated aficionados trekking between them to get as close to the musicians as they could. American popular music was birthed in those cotton fields. More than any other aspect of our culture, our popular music reflects its roots: the musical lifeline of a horribly oppressed people, so powerful in its expression of sorrow and hope that it was adopted by the oppressors, filtered and altered by each subgroup to pick it up, transformed again and again, influences percolating back and forth between communities of color and the white majority (soon to become a plurality). In time, this music conquered not just the nation, but the world: jazz, the blues, rock and roll have transformed the popular music of every other culture. Therein lies my hope. It should not surprise anyone that so many musicians find a way to work the word "peace" into their acts. There is no peace like that which grows between human beings sharing a musical experience. Put your hand on your hip, let your backbone slip, give yourself over to the beat, and in no time, you'll feel kinship with the singer, the drummer, the dancer, as you share in the united diversity of the blues. Because, as with the music, the truth is far more complex than any partisan shenanigans might lead you to believe: if America is to be truly great, it must acknowledge the beauty and power of diversity. We've got to find ways to affirm the uniqueness of all the individuals around us, to embrace their differences from ourselves, to allow our own identities to be transformed by those differences, and then marvel at the beauty that emerges from that cross pollination. Without the blues, there is no American music, no great culture to celebrate, no dancing, no singing along, no ecstatic realization that people of all colors and creeds share a common humanity. Drawing diversity together gave birth to this nation and made it strong. That can happen again; and being a musician, I cannot help but think it can start with a guitar riff, a dance step, and a plagal cadence.